A study released today from an international team of researchers shines new light on "co-infections," infectious diseases that attack the immune system simultaneously. The findings offer insights for treating malaria and worm infections and can help public health officials disentangle how infectious diseases compete in the human body. Princeton ecologists Andrea Graham and Sarah Budischak examined data from an Indonesian study of 4,000 patients who had two parasitic infections: malaria and hookworm. They focused on the malaria patients who also received deworming treatment and discovered previously unknown interactions between the species. 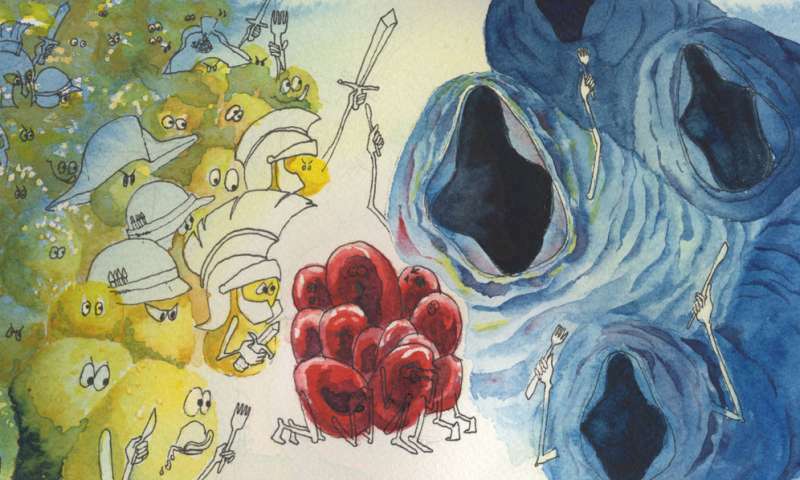 Their ecological perspective proved vital to teasing apart the data and realizing that the co-infecting species are fighting over a shared resource: red blood cells. "Co-infecting agents can interact within the ecosystem of the body just as species interact on the savannah, via resource competition—predation and all," said Graham, an associate professor of ecology and evolutionary biology and co-director of the Program in Global Health and Health Policy at Princeton University. "Ecologists, thinking about species interactions within the body holistically, can shed light on human health." When most people think of ecology, they think about the food pyramid of the rainforest or the Serengeti, said Graham, but the same resource battles that explain lion-wildebeest-grass ecosystems can apply to parasites within the human body. By taking competition for red blood cells into account, she and her colleagues revealed that removing worms from patients who also had malaria allowed their malaria to grow to nearly three-fold higher densities. Conversely, the presence of the bloodsucking worms reduced the density of malaria parasites by over 50 percent. In other words, deworming can exacerbate malaria infections, potentially causing more severe symptoms and increasing the risk of transmitting malaria to other people. They published their findings Feb. 15 in the journal Ecology Letters. "Whether and how infections interact has important implications for human health and disease spread," said Budischak, a postdoctoral researcher in Graham's lab who is the first author on the paper. Malaria and soil-transmitted worm infections remain two of the most common and co-occurring types of human infectious diseases, but if and how they interact is a longstanding debate, Budischak said. Using their ecological expertise, she and Graham were able to solve this malaria-worm mystery by recognizing that malaria parasites and certain worm species rely on the same resource within the host ecosystem: red blood cells, the oxygen-carrying workforce of the human circulatory system. The key to uncovering this strong but hidden effect was changing perspectives, Graham said. The immunologists were looking from a top-down view, focusing on how the immune system attacked the different parasites. That's like looking at the Serengeti and thinking lions determine the populations of herbivores like zebras and wildebeests. That's true in some cases—but more often, both predators and food availability are important. "Malaria parasites are ecologically in a similar position to those herbivores," Graham said. "They're depending on resources below them on the food chain—for herbivores it's the greenery, for malaria parasites it's the red blood cells—and then all of them are subject to predation from above. For herbivores it's predators like lions, for parasites it's the immune system." Worms are in a similar position in the food chain: they are at risk from immunological "predators," and hookworms eat red blood cells (though other worms instead eat food within the host's belly). Because only some worms compete with malaria parasites for red blood cells, this study highlights the importance of distinguishing among parasite species in terms of how they function and which resources they use. "Of particular interest in this study is that it is the application of ecological thinking that has enabled the elucidation of the helminth [hookworm]-malaria relationship," said Joanne Lello, a senior lecturer in biosciences at Cardiff University who was not involved in the research. "If resource competition had not been considered, helminths would continue to be treated as a single group and the relationship between these parasites might never have been clarified. The wider implication of this work is therefore in its promotion of ecological thinking and approaches in the field of medical research." Just like other animals, some disease-causing species are better competitors than others. The bloodsucking hookworms outcompete one species of malaria, Plasmodium vivax. Interestingly, the other species of malaria, P. falciparum, can outcompete hookworms, especially when they are newly infecting a previously dewormed individual. The ecologists determined that the difference in the reaction to deworming is a function of how "picky" the malaria species are. "If the hookworms are reducing the number of red blood cells that are around, the vivax, which is pickier in which red blood cells it can use, just doesn't have enough to replicate as quickly," Budischak said. "But the falciparum, which use any red blood cell around, can find enough red blood cells to replicate. So the worms slow down the vivax because it's a really finicky eater, whereas the falciparum, which will eat anything, outcompetes the worms." Previous studies had missed this competitive hierarchy because all malaria and worm species were lumped together. Graham and Budischak's focus on species resource needs was key to sorting the data and discovering that deworming allows vivax malaria populations to increase by as much as three times. "Although deworming may still provide net health benefits to this human population, our study suggests it has the potential to exacerbate the severity of some malaria infections," said Budischak. "If you mass administer deworming pills, you risk making individuals who have vivax malaria hiding in their blood cells sicker—and you also might make the mosquitos more likely to pick up malaria and pass it on from those individuals," said Graham. "So, if logistics and cost permit it, we would advise a 'test and treat' policy, where you tailor what you do to your patient. If it's a child who's got a lot of worms, definitely deworm. But if it's a kid with a light worm burden, then we'd suggest weighing in the malaria risk—in the neighborhood, in that season of the year. Is deworming worth the malaria risk? Weigh up the costs and benefits." Graham met one of the principal researchers on the Indonesian clinical deworming trial, Maria Yazdanbakhsh, at a conference in Brazil that Graham co-organized three years ago. Graham recalled Yazdanbakhsh and her collaborator Erliyani Sartono, parasitologists from the Leiden University Medical Center in the Netherlands, coming up afterward to discuss their clinical trial that might just have the data necessary to address this disease interaction question. Graham, Sartono and Yazdanbakhsh decided to put their heads together and this study is the fruit of their collaboration. Graham had spent years testing her theories in mice. "In mouse experiments, you can control the dose and the timing of interaction between malaria and worms," she said. "Repeatedly, in the mice, we saw that red blood cell competition, rather than the immune response, seems best to explain the outcome of worm-malaria co-infection. So this [collaboration] allows us to ask, 'Wow, this resource competition that we observed in the mouse system, can we also observe it in humans?'" Graham and Budischak hope that their discovery encourages more public health researchers to collaborate with ecologists. "Infectious disease clinicians don't necessarily realize that they might learn something from ecologists," said Graham. "But ecologists, coming in laterally into a clinical trial context—thinking holistically about what is regulating the size of the malaria population inside a person's body—were able to make more sense of the health outcomes than the more standard, immunological-based approach."